sysnd = absorbDelay(sysd) absorbs all time delays of the dynamic system model sysd into the system dynamics or the frequency response data. For discrete-time models (other than frequency response data models), a delay of k sampling periods is replaced by k poles at z = 0. For continuous-time models (other than frequency response data models), time delays have no exact representation with a finite number of poles and zeros. Therefore, use pade to compute a rational approximation of the time delay. 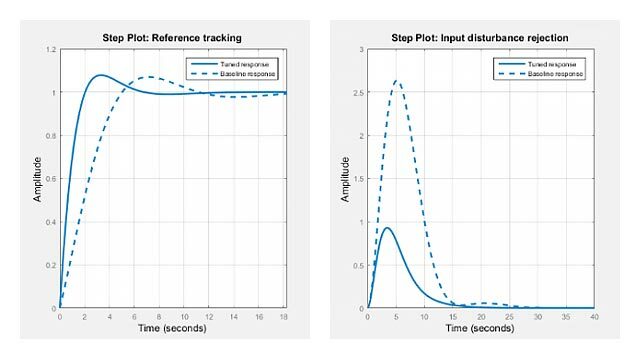 For frequency response data models in both continuous and discrete time, absorbDelay absorbs all time delays into the frequency response data as a phase shift. [sysnd,G] = absorbDelay(sysd) returns the matrix G that maps the initial states of the ss model sysd to the initial states of the sysnd. Create a discrete-time transfer function that has a time delay. The display of sysd represents the InputDelay as a factor of z^(-3), separate from the system poles that appear in the transfer function denominator. Absorb the time delay into the system dynamics as poles at z= 0. The display of sysnd shows that the factor of z^(-3) has been absorbed as additional poles in the denominator. Verify that sysnd has no input delay. Create a discrete-time polynomial model. Convert m to a transfer function model. The numerator of the transfer function, sys, is [0 2 3] and the transport delay, sys.IODelay, is 2. This is because the value of the B polynomial, m.B, has 3 leading zeros. The first fixed zero shows lack of feedthrough in the model. The two zeros after that are treated as input-output delays. Use absorbDelay to treat the leading zeros as regular B coefficients. The numerator of sys2 is [0 0 0 2 3] and transport delay is 0. The model m2 treats the leading zeros as regular coefficients by freeing their values. m2.Structure.B.Free(2:3) is TRUE while m.Structure.B.Free(2:3) is FALSE.